Today is November 7, quite possibly the true date of Samhain, the Old Irish name for the moment when the “portals” or “White Doors” as W.B. Yeats named them, open between the World of the Living and the World of the Ancestors. All Hallow’s Eve, or Hallowe’en as we now call it is the time in which all Spirits, ancient and new may cross through the subtle realms between incarnate and ancient, the material and the magical. November 7 is the Lunar Calendar date for the significant moment the pagans celebrated as the beginning of their New Year. The more modern Gregorian Calendar somewhat arbitrarily moved the ancient celebrations around in order to align them with the Saints’ Feast Days and Christian Holy Days. All Hallows is the beginning of profound seasonal change when the introverted, inward-turning Feminine absorbs the extroverted, highly active Masculine. The Green Man, celebrated throughout the lusty rise of the year now rests as a newly inseminated seed in the Earth Womb of the Great Mother. He will gestate, hidden and secret, like all of the Northern snow-covered realms. He will come again, to be born on the Winter Solstice. The villagers around Crested Butte have been putting their gardens to bed, moving horses to winter pastures, chopping wood, canning, drying fruit, using yards of heat-tape and insulation and gathering-in before the first great blizzard draws down upon us. Very soon all activities will be surrounded by landscapes of white, ice rime and the mighty breath of Uler. Already the inner world lures us to retreat. This is the most mysterious time of all. The bones of the trees show forth, their dried leaves and feathery needles creating a mist throughout the forest. It is easy to get lost on familiar paths, to be drawn away, or“Glamoured” as the Irish say, by the Little People and the Faeries. The Brown trout in the stream have finished their busy couple’s work of immaculately cleaning their spawning bed. The floor of our pond gleams with the muted gem colors of stones. Mr. and Mrs. Brown are floating languidly in circles, or resting side by side after the ardor of their mating dance. I have discovered many more Faerie Houses tucked here and there around our yard--creations designed for the Little People’s transition from Autumn to Winter. There is a harvest of twin-berries, rose-hips and juniper berries collected in a root-cellar created from stone and moss. Someone has thoughtfully left a fallen bird’s nest woven of my cats’ fur, horsehair and cottonwood fluff. They have built a wicker roof and caulked it with river mud. This structure is set into the roots of a spruce tree, protected from snow and ice fall. Gifts of many sizes and generosity of spirit have been arriving here at WiseAcre. One of which is a portrait, drawn for me by a precious daughter-friend and artist. This reminds me of a moment so exquisite, so unique that it stands out as a sudden brilliant flash in the constellation of my memories. I am sitting in my back yard between our grandmother Engleman spruce and the river garden. It is mid-afternoon of a brilliant, cool day. I am not alone. In fact, I am sharing this beautiful day with a rare and truly kindred spirit, Hayley Hara. We sit across from each other with the river light flickering and sun bright and warm on our shoulders. A lustrous moment of silence pauses our conversation,. This is the stolen heartbeat, that almost-missed second in which we see a faerie flutter and dance on a sun mote between us! We simply stare at the brilliant shape, the shimmering aureole around it, the quiver of wings. Then, after a moment of suspended flight, as if it is balanced on some powerful, unseen quality of the golden air, the Creature shoots straight up and disappears. We gaze at each other, unable at first to speak. I watch Hayley’s expression change from stunned admiration to sheer delight. I imagine that I have a similar look on my face. Then we both begin babbling ecstatically: “Did you?…Was that?…Right here?…Really?…REALLY! THEY DO EXIST!” we shout together, bouncing on our chairs like little kids. We are little kids again, because we have shared a Faerie Sighting and we are younger and more filled with wonder than we have been since childhood. So. I have a watermark, a ring in the tree to refer to when people ask me if I have ever seen a faerie. YES! Several times: once when I was chronologically very young, then another spellbinding time, many decades later. And, Hayley holds this place with me as a witness, in the chapter, on the page, in the Book of Magik which is one of the most delightful of my life. It is many years later. Hayley Hara is now a fine, multi-media artist living in New York and widely exhibited there and the East Coast. She has a wonderful husband, who she met here in Crested Butte. They have two glorious daughters, Sachie and Fiona for whom I have written poems upon their birth. (please see three poems) There IS something which bonds us even more deeply--we have shared a messenger from another realm. And, beautifully, Hayley has continued to create the imaginal portraits, cartoons, drawings, animation, paintings and portraits of these realms in her exquisite self-portraits and portraits of others. When she was 19-years old, and we had just begun knowing each other, Hayley painted and gave me the portrait of herself, rising up, spreading her wings, discovering herself as a woman and an artist. 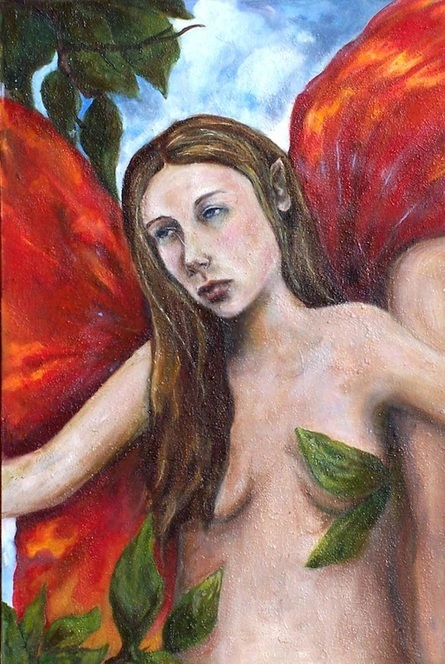 Here you see a detail of this early painting, and of Hayley launching herself upon brilliant red wings! This summer Hayley gifted me with my own portrait. You see it here, with images of my birth family and extended Crested Butte Family included in the Circle. My parents, Mark my life partner, our horse Bow, Friends-in-fur from many years, my sister, brother, nephew, dearest friends still on this plane, and one who has crossed over to the realm of the Spirits are all depicted here. 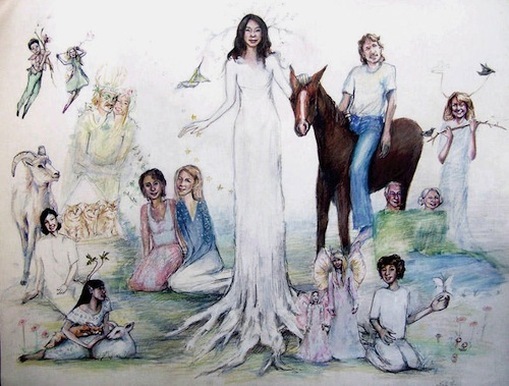 In the lower left corner of the drawing you will also see Hayley-with her arms around a fox and a white fawn. The space Hayley has artistically created for me, grounded, rooted and spread-armed with love and gratitude is all that I hope to attain in this sweet sojourn we call LIFE. Certainly, I have a long way to go. And yet, Hayley’s imagery reminds me of how immediate these simple blessings are. Charming, witty, fey, magical, wise and knowing—this is the vision she shares. Please visit www.hayleyhara.com for a portfolio of the sketches, paintings, commissioned portraits and animation she has most recently created. Stay tuned for more Magikal Intuition from this lovely and provocative artist. Keep Watch! The Enchanted Hour is upon us.